The soma (pl. somata or somas), perikaryon (pl. perikarya), cyton, or "cell body" is the bulbous end of a neuron, containing the cell nucleus. The word "soma" comes from the Greek σῶμα, meaning "body". There are many different specialized types of neurons, and their sizes vary from as small as about 5 micrometres to over 10 millimetre for some of the smallest and largest neurons of invertebrates, respectively. The soma (main part of the neuron in which the dendrites branch off of) contains many organelles, including granules called Nissl granules, which are composed largely of rough endoplasmic reticulum and free polyribosomes. The cell nucleus is a key feature of the soma. The nucleus is the source of most of the RNA that is produced in neurons. In general, most proteins are produced from mRNAs that do not travel far from the cell nucleus. This creates a challenge for supplying new proteins to axon endings that can be a meter or more away from the soma. Axons contain microtubule-associated motor proteins that transport protein-containing vesicles between the soma and the synapses at the axon terminals. Such transport of molecules towards and away from the soma maintains critical cell functions. 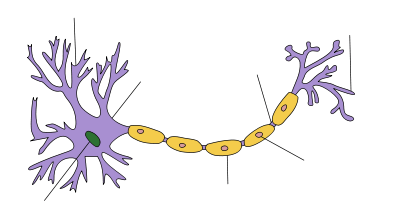 The axon hillock is a specialized domain of the neuronal cell body from which the axon originates. A high amount of protein synthesis occurs in this region, as it contains a large number of Nissl granules (which are ribosomes wrapped in RER) and polyribosomes. Within the axon hillock, materials are sorted as either items that will enter the axon (like the components of the cytoskeletal architecture of the axon, mitochondria, etc.) or will remain in the soma. In addition, the axon hillock also has a specialized plasma membrane that contains large numbers of voltage-gated ion channels, since this is most often the site of action potential initiation. The survival of some sensory neurons depends on axon terminals making contact with sources of survival factors that prevent apoptosis. The survival factors are neurotrophic factors, including molecules such as nerve growth factor (NGF). NGF interacts with receptors at axon terminals, and this produces a signal that must be transported up the length of the axon to the nucleus. A current theory of how such survival signals are sent from axon endings to the soma includes the idea that NGF receptors are endocytosed from the surface of axon tips and that such endocytotic vesicles are transported up the axon. 1 2 Squire, Larry; Berg, Darwin; Bloom, Floyd; du Lac, Sascha; Ghosh, Anirvan; Spitzer, Nicholas, eds. (2008). Fundamental Neuroscience (3rd ed.). Academic Press. ISBN 978-0-12-374019-9. ↑ Delcroix JD, Valletta J, Wu C, et al. (2004). "Trafficking the NGF signal: implications for normal and degenerating neurons". Prog. Brain Res. 146: 3–23. doi:10.1016/s0079-6123(03)46001-9. PMID 14699953. 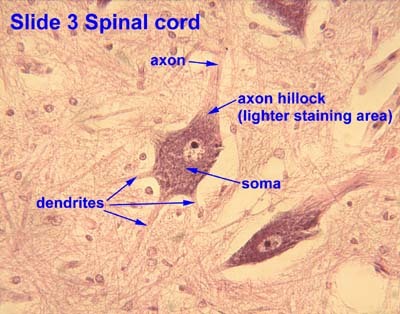 Histology image: 3_09 at the University of Oklahoma Health Sciences Center - "Slide 3 Spinal cord"